Unless otherwise noted, copyright (and any other intellectual property rights, if any) in this publication is owned by the Australian Pesticides and Veterinary Medicines Authority (APVMA). With the exception of the Coat of Arms and other elements specifically identified, this publication is licensed under a Creative Commons Attribution 4.0 Australia Licence. This is a standard form agreement that allows you to copy, distribute, transmit and adapt this publication provided that you attribute the work. A summary of the licence terms is available from www.creativecommons.org/licenses/by/3.0/au/deed.en. The full licence terms are available from www.creativecommons.org/licenses/by/3.0/au/legalcode. Source: Licensed from the Australian Pesticides and Veterinary Medicines Authority (APVMA) under a Creative Commons Attribution 4.0 Australia Licence. In referencing this document the Australian Pesticides and Veterinary Medicines Authority should be cited as the author, publisher and copyright owner. iStockphoto images are not covered by this Creative Commons licence. The terms under which the Coat of Arms may be used are set out on the website of the Australian Government Department of the Prime Minister and Cabinet (www.dpmc.gov.au/pmc/publication/commonwealth-coat-arms-information-and-guidelines). The material in or linking from this report may contain the views or recommendations of third parties. Third party material does not necessarily reflect the views of the APVMA, or indicate a commitment to a particular course of action. There may be links in this document that will transfer you to external websites. The APVMA does not have responsibility for these websites, nor does linking to or from this document constitute any form of endorsement. The APVMA is not responsible for any errors, omissions or matters of interpretation in any third-party information contained within this document. 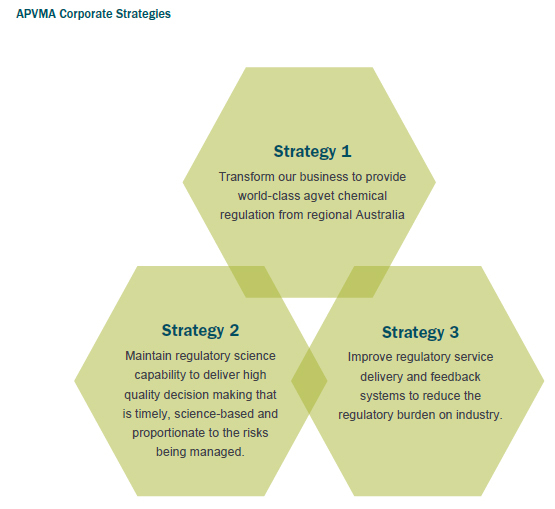 As Chief Executive Officer for the Australian Pesticides and Veterinary Medicines Authority (APVMA), I am pleased to present the 2018–19 Corporate Plan, which lays the foundation for a modern and capable regulator, positioned to respond to the needs of its clients and stakeholders. The APVMA is on a path of reform as we transition regulatory operations from Canberra to Armidale in regional New South Wales. The relocation provides opportunities to reset the organisation and make foundational improvement to our digital capability. We will use these opportunities to improve internal business systems and processes, and to modernise our regulatory services for clients through an enabling technology program. We are known for the quality decisions that we make which protect the health of plants, animals, humans and the environment. These continue to be our focus as we overlay the reforms, and the opportunities these reforms present. Retaining knowledge and regulatory science capability is a key priority for the APVMA. Our corporate plan outlines the strategies in place to navigate this challenge, to attract a skilled workforce and manage the risks of staff separations. In the year ahead, we will remain focused on continuous improvement in our operational efficiency by implementing priority recommendations from the Independent review of assessment performance. Monitoring performance and efficiency gains will be key in delivering long-term improvements to our regulatory service. Our financial sustainability must also be assured and this will require us to work closely with our stakeholders as we consider the most appropriate mechanisms to reflect the true cost of providing our regulatory functions. The strategic priorities in this plan focus our efforts on further establishing Armidale operations, priority recruitment of core capability, and implementing the foundational information and communication technologies (ICT) and business process improvements that enable improved performance from Armidale. This plan sets out the strategic priorities for the APVMA for the period 2018–19 to 2021–22. A corporate plan is required under Paragraph 35(1)(a) Section 95(1)(a) of the Public Governance, Performance and Accountability Act 2013 and Section 51 of the Agricultural and Veterinary Chemicals (Administration) Act 1992. The plan is prepared in accordance with the Public Governance, Performance and Accountability Rule 2014. Progress toward meeting the goals of the corporate plan will be reported each year in our annual report. The performance measures contained in this plan are complemented by the APVMA Regulator performance framework. The corporate plan will be reviewed annually and adjusted as necessary. The APVMA is the independent statutory authority responsible for assessing and registering pesticides and veterinary medicines proposed for supply in Australia. Our functions are set out in Section 7 of the Agricultural and Veterinary Chemicals (Administration) Act 1992. We operate under an Intergovernmental Agreement between the Commonwealth Government and all states and territories. Under this agreement, we provide a regulatory service for the supply of safe and effective agricultural and veterinary chemicals in Australia. Our regulatory responsibility extends from registration and manufacturing through to the point of sale. Compliance and monitoring powers in the Agricultural and Veterinary Chemicals Code Act 1994 provide a mechanism for us to undertake post market surveillance and testing to ensure the continued safety and effectiveness of registered products. We provide a regulatory service for the supply of safe and effective agricultural and veterinary (agvet) chemicals in Australia. To be a world leader in agvet chemical regulation, that uses the best science and attracts strong investment to register safe products that advance Australia’s agricultural productivity and animal health. We place clients at the centre of our business, invest in our people and embrace technology to define how we regulate — ensuring our decisions are risk-based and transparent. As an Australian public service agency we are impartial, committed to service, accountable, respectful and ethical. To ensure we maintain a regulatory service delivered in line with legislative requirements and matching client expectations of a modern regulator, we adopt and promote the following cultural traits which are critical to our success. June 2018 marks 25 years of Australia’s national regulator overseeing the registration of agvet chemical products. While our name has changed over the last 25 years, the APVMA has set the standards for products to be manufactured, imported, supplied, sold or used in Australia. Our regulatory scientists contribute to and apply international best-practice. 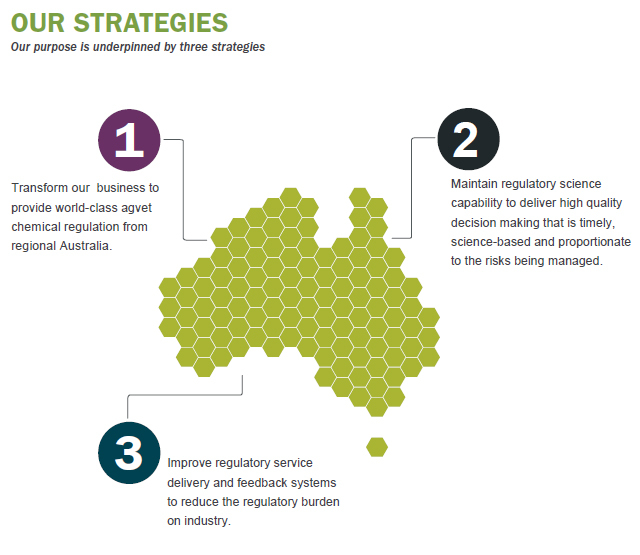 Australia’s expertise in regulatory science is recognised around the world. The forward challenge is to ensure we continue to provide world-leading regulatory services and improved operational performance that is enabled by modern technology and delivered by a capable workforce operating from regional Australia. Our regulatory service will be influenced and informed by changes in our operating environment. We must be agile to anticipate, prepare for and respond to industry innovation, new science and agricultural practice. Australia is at a crossroads in terms of economic growth and governments are increasingly looking at new opportunities to drive economic and societal change. Agribusiness is proposed to have the greatest comparative advantage in rising to the challenges of global megatrends including a less predictable planet, choosy customers and increasingly global supply chains (CSIRO, 2017 and Deloitte, 2014). There is a strong demand for new crop protection and animal medicines to be made available in Australia and it’s important the APVMA delivers a regulatory service that is responsive and can support innovation in our agricultural sector. Population growth is increasing the demands on global food and fibre. To meet this need, Australian agribusinesses rely on the supply of safe and effective pest management tools to maximise and protect value in their supply chain. An increasing focus on science and technology, matched by stronger investment in research and development in the agribusiness sector will be important to meet the emerging needs of global customers (CSIRO, 2017). In this environment, a regulator must anticipate and respond to new advances. Agvet chemicals are a range of products developed to protect our crops, livestock and domestic animals. 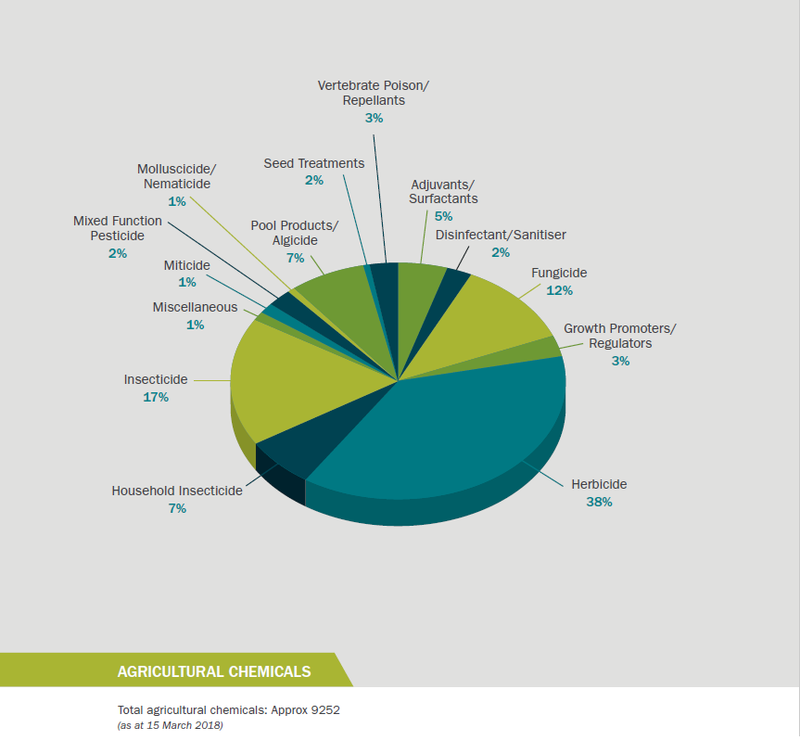 Herbicides and insecticides are the largest categories of agricultural chemicals available in Australia. For veterinary medicines, it is parasiticides, and nutrition and metabolism products. Combined, these products provide long-term benefits to Australian agriculture by reducing the effects of weeds, pests and diseases on agricultural production. Access to veterinary chemicals also supports the health of Australian domestic and companion animals. Using agvet chemicals means we have increased productivity, better quality produce and more competitive industries. Sales of crop protection products in Australia topped $3.2 billion in 2016–17 (APVMA, 27 March, 2018). It’s an industry that employs 1 725 directly in the manufacturing process and another 7 500 indirectly through the input supply for crop protection products (Deloitte Access Economics, 2018). Independent analysis suggests that $20.6 billion of Australia’s agricultural output can be attributed to the use of crop protection products (Deloitte Access Economics, 2018). Many of our crucial food crops and livestock production would be commercially unviable without the use of agvet chemicals registered with the APVMA. While Australia’s veterinary medicines sector is smaller in scale to its agricultural counterpart, the sale of veterinary chemical products in Australia has grown to exceed $1 billion (APVMA, 27 March, 2018). There are more than 24 million pets in Australia and owners are spending more than ever on premium products for their animals (Animal Medicines Australia, 2016). The next wave of opportunity in agribusiness is centred on livestock production and outputs which will continue to drive the development of new veterinary medicines that require regulatory approval. Australia’s agvet chemical manufacturing sector is small in comparison to other countries. 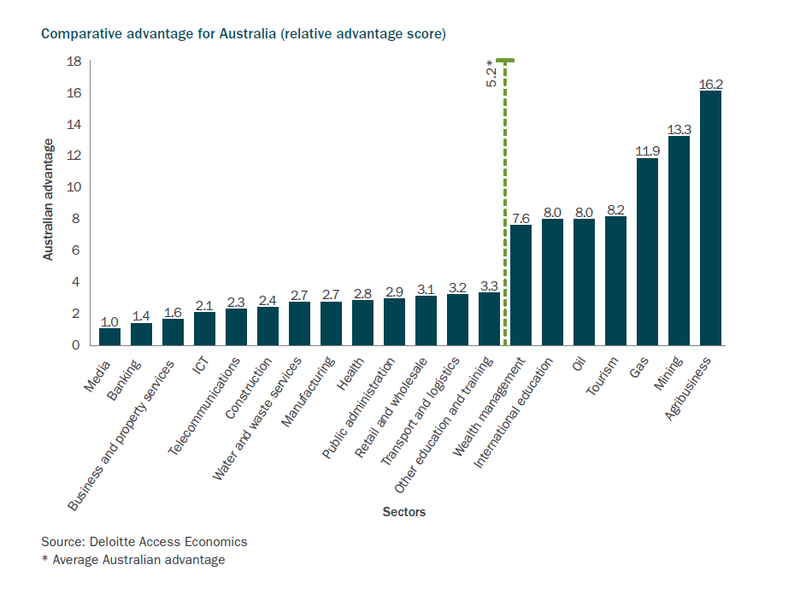 Industry exports account for approximately 13 per cent of agvet products (Deloitte Access Economics, 2013). Domestic manufacturers are increasingly looking to India and the Asian market to supply chemical materials at a reduced cost or to outsource the manufacturing process overseas, which will demand more sophisticated monitoring programs to verify compliance and product quality. Given the importance of getting a product to market to meet seasonal demands, our assessment process must be efficient, responsive and transparent. This means a continued focus on improved processes and systems, and greater use of international data, assessments and standards where applicable. The gross value of farm production is forecast to decline by 5 per cent to $59 billion in 2017–18 which reflects an assumed return to average seasonal conditions, however this still remains high. It is predicted to increase to $61 billion in 2018–19 (ABARES, 2018). 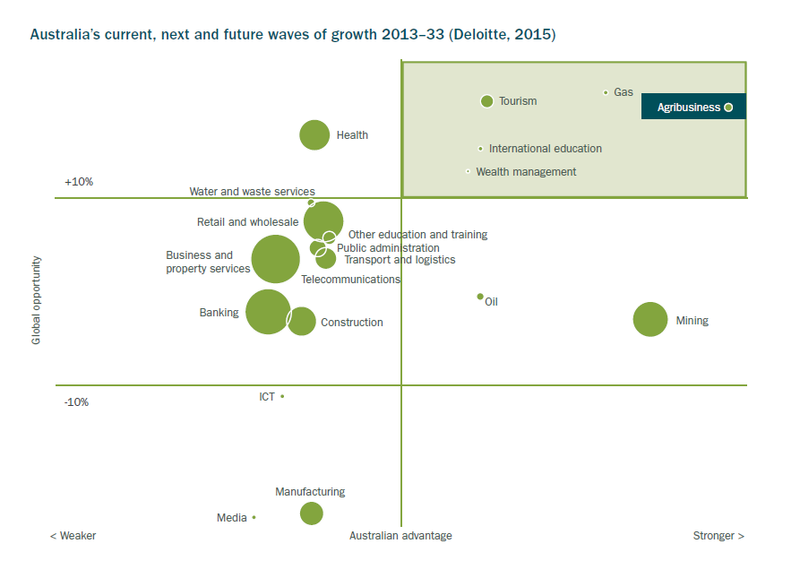 Agribusiness features strongly in Australia’s current, next and future wave of economic growth through to 2033 (Deloitte, 2014). A key focus for Australian agriculture is to improve productivity and limit potential losses, to take advantage of domestic and international opportunities. Seasonal conditions have significant implications for crop yields and livestock production cycles which in turn will implicate changing demands on registered agvet products and appetite for new and innovative products to be brought to market. These changes in environmental conditions have implications for our workload and resource requirements. Rainfall in 2017–18 was above average in western and northern Australia, and prolonged high temperatures and drier than normal conditions have prevailed across eastern Australia. These variations in weather have been unfavourable for soil moisture levels and on-farm water supplies. If conditions continue, soil moisture available for crops and pastures may be limited ahead of winter cropping season (ABARES, 2018). Such changes may increase demand for emergency permits and will influence the regulatory assessment of environmental and safety risks for new and existing agvet chemical products. However, there will be a rise in demand for agricultural production and an increase in global food demand as the world’s population grows by an expected 60 million people a year over the next 20 years (Deloitte, 2014). Incomes will rise in emerging economies and there will be a rise in the demand for protein — a shift from grains and cereals to dairy, fruit and vegetables — which is a swing to more intensive land use. These changes in Australian farming practice will raise new considerations around use patterns and labelling for us as regulators of agvet chemicals. The growing importance of Australian agricultural production and aquaculture will be matched by industry expectations for responsive regulation that positions Australia to maximise domestic and international opportunities. In 2015–16 agricultural exports accounted for 16 per cent of all Australian produce exports (Deloitte, 2018). The facilitation of Australian agricultural exports require responsible policy settings and continued adjustments to maximum residue limits for agvet chemicals that align with international standards. The Australian community derives many benefits from the use of agvet chemicals. The most obvious is increased agricultural productivity and others include the wellbeing of companion animals and the protection from pests and diseases, including zoonoses, which affect human health. In enjoying those benefits, the community has certain expectations of us as the agvet chemical regulator. Even if some do not know our name, who we are or what we do, there is an expectation that the regulator acts as an active gatekeeper, ensuring that only those products which are safe are approved, and that we monitor the market to ensure compliance with regulatory standards. Today there are more than 24 million pets in Australia. Owner attitudes have shifted in favour of preventative health care and away from the more traditional treatments of disease, illness and injury (Animal Medicines Australia, 2016). An expansion of so-called ‘natural’ veterinary medicines claiming to be natural, organic or chemical-free may still require registration with us and demand monitoring. This is necessary to ensure compliance with Australian regulatory standards and to safeguard animal health through management of good manufacturing practice. Consumer attitudes towards food safety have also altered drastically in recent years. Access to social and mass media have created a more informed and discerning consumer with greater awareness of food safety issues, including chemical residues. The modern, health-conscious consumer has created strong demand for natural, organic and local produce and influenced trends towards hormone free as well as humanely sourced eggs, poultry and meat. The growing organic food sector and social movements promoting farm to table produce are influencing agricultural practice and changing the types of chemicals and veterinary medicines being brought to market. The world’s ageing population is also having an effect on food production as the incidence of chronic disease is rising globally, diets are changing and increasingly sedentary lifestyles are all influencing the types of food and beverage products consumers demand (CSIRO, 2017). 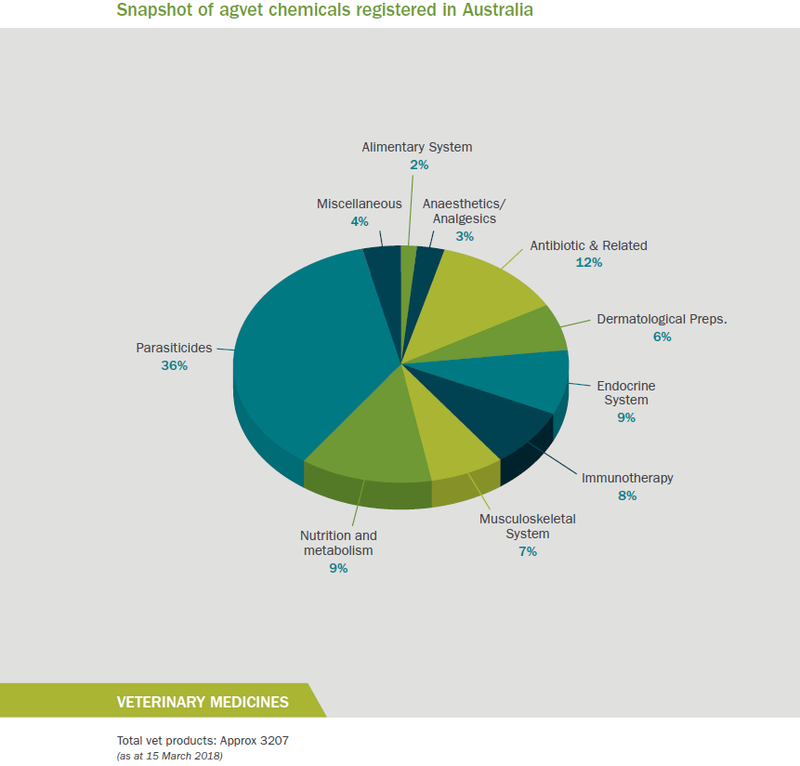 There are other players in the regulation of agvet chemicals in Australia, each with different roles. Even though we are responsible for one part of the national regulatory system, the community often attributes all agvet chemical issues to us. It is important that we clearly communicate our area of responsibility and continue to advocate a whole of system response to chemical registration and use, informed by robust science. Australia has a fast evolving digital environment driven by consumers and businesses, who have rapidly adopted cheaper and more convenient digital tools such as social media, mobile and cloud technology (Deloitte Access Economics, 2017). In response, the Australian government digital transformation agenda sets a whole-of-government direction to invest in digital services that puts users first, automates back office administration and reduces manual processes, to free up qualified staff to deal with more complex matters (Digital Transformation Agency, 2018). Funding allocated in Budget 2018 provided $10.1 million over three years to deliver our digital strategy. Priority investment in our technology platforms, complemented by improved business processes and a new business operating model, will enable more efficient regulatory services for industry by unlocking productivity gains in the assessment and registration of agricultural and veterinary chemicals. An independent review of our assessment performance confirmed a level of volatility in the assessment and registration of agvet chemicals (Reason Group, 2017). A number of factors influence our ability to deliver services in line with legislative timeframes and the forward priority for us is to implement the recommendations in the review and make foundational changes that will improve regulatory efficiency over time. Clients expect responsive and efficient regulatory services from us that are delivered within the legislative timeframes. A 2018 benchmark of client service experiences found 42 per cent of our clients and stakeholders are satisfied with our regulatory performance (Colmar Brunton, 2018). Timeliness of regulatory approvals and decisions was identified as a key factor influencing client and stakeholder perceptions of performance and will be a focus of future business process reform to be enabled by digital technology. Our challenge will be to maintain service levels and consumer confidence as regulatory operations transition to Armidale in 2019 and we manage the risk of staff separations. In 2016 the government approved $25.6 million in appropriated revenue to fund the relocation of APVMA regulatory operations to Armidale, NSW. In 2019 we will operate from a newly constructed leased premises in Armidale, delivering the 2016 Government Policy Order to relocate operations from Canberra. A new business model will be supported by up to 150 regulatory scientists and corporate professionals, including support from shared services, e-working arrangements, external assessors and providers. Transition and consolidation of regulatory operations in Armidale will take time and we will retain access to scientific capability to ensure knowledge transfer. A new enterprise risk management framework supported by enhanced governance arrangements will support the authority to address relocation risks, including the challenges faced by staff separations and the loss of corporate knowledge. The public sector focus on improved regulation recognises that regulatory intervention must be financially sustainable, proportionate to risks and sufficiently streamlined. We will seek opportunities to reduce the burden on industry and implement recommendations from the Independent review of assessment performance through agvet chemical legislative reform lead by the Department of Agriculture and Water Resources. Understanding the operational effect of legislative changes proposed in the Agricultural and Veterinary Chemicals Legislation Amendment (Operational Efficiency) Bill 2017 will position us to implement required reforms and deliver a regulatory service that aligns with industry and government expectations. Ensuring regulatory services are appropriately funded is also a consideration for our current and future operations. A 2017 report on APVMA funding and cost recovery identified an imbalance between current revenue and expenses (PricewaterhouseCoopers, 2017). Preparatory work to determine our cost base will enable a dialogue with industry on an appropriate funding model that reflects the changes in business process and the resources required to deliver modern regulatory services. The year ahead will see an extensive program of organisational change for the APVMA and the streamlined corporate strategies implemented in 2017–18 continue to focus our efforts towards those activities that minimise operational risk and enhance performance as we establish regulatory operations in Armidale. Future years will focus on embedding new systems and technology that support a refined business operating model. Over time, many of these activities will become a part of our business as usual processes to enable continued improvements to be made. We are implementing the Public Governance, Performance and Accountability (Location of Corporate Commonwealth Entities) Order 2016 and implementing a relocation program that transitions our workforce and our operations to Armidale in 2019. The APVMA in Armidale relocation strategy 2016 continues to guide the delivery of key enabling elements that establish our workforce, and progress implementation of a new business operating model for Armidale. A revitalised risk framework and stronger management practices will support the successful transition and ensure our world-class regulatory services are delivered from regional Australia. We have received $25.6 million over six years from 2016–17 to 2021–22 to support effective relocation. A further $10.1 million has been allocated between 2018–19 and 2020–21 to fund the APVMA digital strategy which will be delivered through an enabling technology program. This investment will address the need to stabilise, digitise and modernise our ICT and enable improved regulatory services from our new home in regional Australia. The relocation of our operations started in 2017 when we opened an interim office in Armidale and provided the opportunity for early relocation of staff. In 2018–19 the Armidale operations will expand to accommodate approximately 37 staff operating from the interim office on Beardy Street and further accommodation will be secured where required. Mid-2019 we anticipate final fit-out of the new permanent premises to be complete in Armidale, which will facilitate a period of operational commissioning and consolidation of existing accommodation both in Canberra and the interim accommodation in Armidale. Business transformation associated with the relocation to Armidale will be finalised by 2022. Implement the APVMA Armidale business model. Modernise information and communication technology through stabilising, transforming and digitising. Ensure the cost of operations are appropriately reflected in current fees, levies and charges. Implement recruitment activities for Armidale in line with the APVMA recruitment strategy. Program oversight for construction of the permanent APVMA premises in Armidale. Establish and maintain a learning culture. Stand up a permanent APVMA office in Armidale. Work with key partners to contribute to an Agricultural Centre of Excellence. APVMA business model based in Armidale. Conduct a review of organisational capability and capacity against business model requirements, having completed the relocation to Armidale. Wind up the relocation property program. Implement adjustments to the business model. Responsibilities for property management become normal business. Monitor and refine people strategies that support the APVMA’s operations in Armidale. Monitor costs, efficiencies and performance metrics to optimise business operations. Assess ICT capability and benefits realised from the APVMA digital strategy. IT service management and support. Identify business requirements for the business application improvement project. Implement remaining activities within the ICT Strategic Plan and deliver business application improvements of the enabling technology program. Progress objectives of the digital strategy and leverage new communication platforms to engage clients and stakeholders in our regulatory business. Utilise a continuous improvement framework to enhance current performance and meet digital service standards. Put in place arrangements to address the APVMA’s operating loss. Commence review of the cost recovery implementation statement (CRIS). Implement new fee structures and cost recovery arrangements. Audit industry levies and address issues of under or over payment. Review and revise cost recovery arrangements where necessary. Maintain regulatory science capability to deliver high quality decision making that is timely, science-based and proportionate to the risks being managed. Our responsibilities for robust decision making are balanced with the obligation to provide an efficient regulatory service for agvet chemical applicants, and this means making quality decisions in a predictable and timely manner. The Independent review of assessment performance 2018 identified multiple factors contributing to delays in assessment of agvet chemicals in Australia. The review outlined a program of reform that we will implement over the forward financial years to enhance application processing and assessment timeframes. Innovation in the agricultural sector and new science demand that we reconsider our regulatory guidance and engage in the discussions that will influence and evolve the regulatory framework. As the national regulator, we must rise to the challenges posed by global issues such as antimicrobial resistance and respond to new farming practices. Transitioning our operations to Armidale in 2019 will further test our performance in terms of capacity and capability. We will build on our existing expertise, recruit the next generation of scientific minds and accelerate the development of Australia’s regulatory science capability through a strong learning culture. Further embedding the Office of the Chief Regulatory Scientist within core assessment areas will ensure the appropriate application of science to robust regulatory decisions. Resetting our risk appetite and tolerance levels will support regulatory efficiencies and better match regulatory burden with risk. Through this, we strive to maintain the quality of decision making, address issues of timeliness and apply our scientific expertise to align the effort of regulatory intervention with the risks being managed. Maintain alignment with international best practice. capability development of new workforce. Establish Office of the Chief Regulatory Scientist. Continue delivery of the APVMA Accelerated Regulatory Science Training program –Diploma of Government (Regulatory Science). Up to date procedures and material. An enterprise risk framework and embedded management practices. Implement high priority recommendations identified in the independent review. Monitor and report on benefits realised through the Agricultural Competitiveness White Paper. Work with Department of Agriculture and Water Resources to pursue efficiencies through legislative reform, including advocating recommendations made in the independent review. Implement the remaining program of reform outlined in the independent review and track efficiencies. Continue to implement outstanding activities from ANAO recommendations and the 2014 legislative reforms. Continue engaging and harmonising with relevant international fora such as Codex, OECD and VICH. Periodic review and update of APVMA risk assessment manuals and data guidelines to align with relevant international standards. The way a regulator implements and enforces its legislation can make a significant difference to the potential burden industry might face. The APVMA does not set the regulatory framework for agvet chemicals. Our role is to implement the legislation and associated regulations. As a regulatory service provider we will balance regulatory efficiency with the need to ensure appropriate protections for the health and safety of people, animals and the environment. 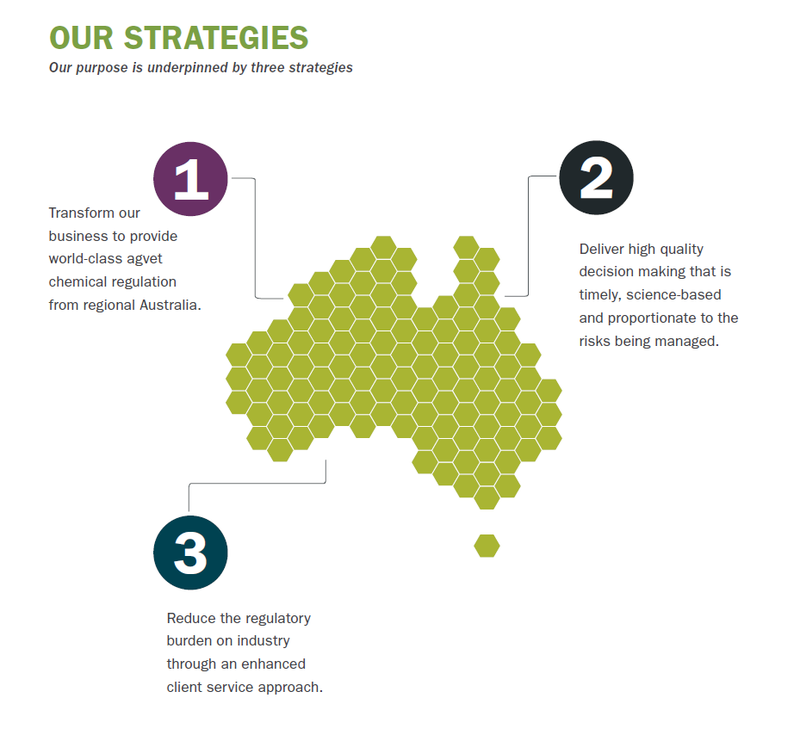 We will continue to implement reforms to our business that enhance client service, streamline administrative burden and improve regulatory responsiveness so that Australia’s agricultural industries can leverage the future economic opportunities for growth and to reduce the regulatory burden on agvet chemical industries bringing new and improved products to market. We are committed to better understand the needs and preferences of our clients and stakeholders. A focus on improved information delivery and streamlined channels will provide more opportunities for self-service and enhance engagement in agvet chemical regulation. A centralised business intelligence capability will enable real-time analysis of regulatory operations, early alert to risks and surveillance of the operating environment. A comprehensive compliance and monitoring program continues to provide verification of reduced regulatory approaches and confirm that risks are appropriately managed. Consolidate APVMA communication and service channels. Develop and implement program of work to support the Australian Government agvet chemical legislative reforms. Implement legislative reforms where and when required. Continue to improve guidance material and information available to applicants to make quality applications. Publish final report on efficacy contestability project and decide on long term viability of the practice. APVMA through various options including increasing the number of APVMA engaged auditors and increased engagement with international stakeholders, e.g. EU. Establish a centralised business intelligence capability. Develop a business intelligence and reporting framework. Business intelligence and reporting framework embedded as a business as usual activity. Improve currency, usability and accessibility of online information at http://www.apvma.gov.au. Set the framework for APVMA stakeholder engagement. Undertake a channel management review and develop a strategy to actively reduce the number of customer and client channels to streamline client service and feedback. Establish new models for engagement and consultation that maximise benefits of digitisation. Implement channel management strategy to streamline channels available to clients and customers seeking to engage with the APVMA. 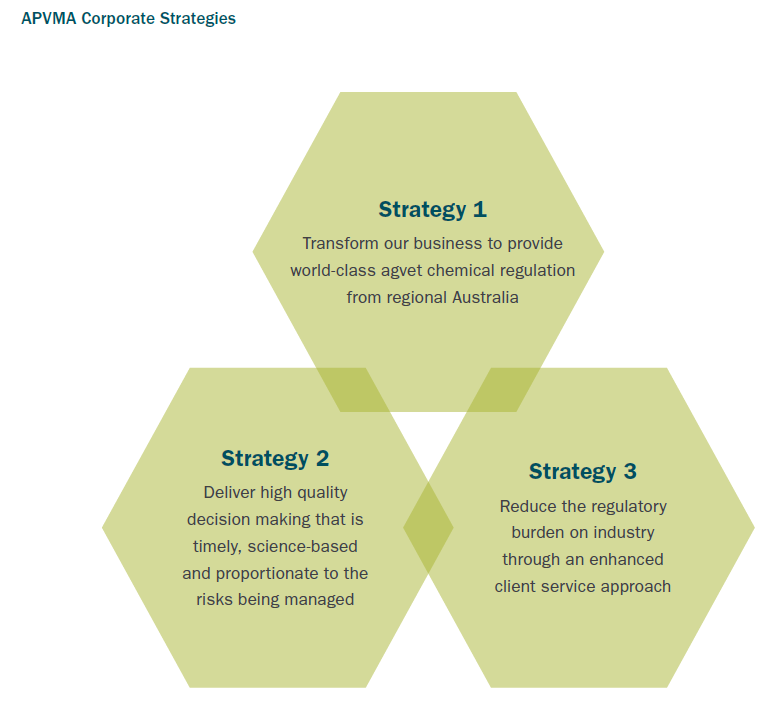 Our corporate strategies are interconnected and align with the APVMA’s 2018–19 portfolio budget statement. Successful delivery in one strategic area will reinforce and build success in all. Our key performance indicators (KPIs) are therefore considered in a holistic manner focusing on the following three themes of relocation risk and program management, quality decision making; and regulatory service delivery. Responsible financial management of APVMA operations including maintenance of equity reserve targets. 100 per cent of chemical reconsiderations finalised in accordance with the program schedule. 60 per cent of emergency permits finalised within 14 days and 95 per cent finalised within 28 days. Reduced burden and reduced cost for compliant manufacturers. Faster processing of non-technical applications and minor variations. The number of applications using data assessment, standards and decisions from comparable regulators. Increased number of compliant manufacturing facilities that qualify for a reduced audit interval of up to 36 months. The average reduction in assessment time achieved for applications using international data. Implementation of legislative reforms and reporting on operational impacts and benefits for clients. The quality and breadth of industry engagement activities delivered each year that meet the needs and preferences of clients and stakeholders. Annual survey of clients and stakeholders to monitor and track the level of satisfaction with APVMA online systems, interactions with clients and stakeholders and regulatory information available online. Alignment with the APVMA client services charter. The APVMA is a cost-recovered agency. Registrants pay application fees to register new products and active constituents, amend a current registration, or apply for a permit. An annual fee is payable each year to renew the registration of a product. Registrants also pay an annual levy based on the sales (and other disposals) of their products. Levies are imposed under the Agricultural and Veterinary Chemical Products Levy Imposition (General) Act 1994, the Agricultural and Veterinary Chemical Products Levy Imposition (Excise) Act 1994 and the Agricultural and Veterinary Chemical Products Levy Imposition (Customs) Act 1994. Levies are collected under the Agricultural and Veterinary Chemical Products (Collection of Levies) Act 1994. Levy rates are prescribed in the Regulations to this Act. Our fees and charges have remained static since June 2015 and have not kept pace with business costs. Once we have established our operations in Armidale, a formal cost recovery impact statement will be prepared. We will engage industry in consultation on the review of our cost recovery framework so that we can ensure a sustainable funding model for our future regulatory operations. Our people are our most valuable asset. Establishing a culture that embraces our vision, mission and purpose as we welcome new staff into Armidale is an important part of our transformation. A changing workforce will be supported by human resource policies and procedures that guide staff contributions towards our purpose of providing quality regulatory services. A focus on knowledge management and a learning and development culture will support high performance and deliver our strategy for maintained workforce capability as we transition to Armidale. Balancing separations with commencements within our budget to maintain business continuity is a priority. Supporting employees separating from us also remains a priority, as will open and timely information about the separation process. Career management support will continue to be offered to employees seeking redeployment. A knowledge management strategy will be finalised in 2018. Not only will it capture critical knowledge of separating employees for training, instructional and information products to support new employees, it will provide a framework to effectively support our knowledge needs into the future. The 2018 Budget allocated $10.1 million over three years for the implementation of the APVMA digital strategy. The digital strategy outlines our vision for a digitally enabled regulator by 2022 and provides a framework for investment in an enabling technology program. The program will deliver ICT solutions which meet the digital strategy objectives to stabilise, digitise and modernise our regulatory service delivery. Our current ICT environment is a physical equipment environment, hosted and supported by a third‑party data centre provider. Existing ICT infrastructure will be migrated to a cloud based infrastructure services arrangement. Flexible working arrangements and technological mobility are becoming necessary in the modern working environment of the APS. There is a greater emphasis on employee work-life balance, decentralisation of agencies and greater collaboration with stakeholders. A telecommunications and collaboration solution that enables employee mobility, remote e-working and virtual teaming capability will become more critical for us as adoption and expectations of digital services increase. Enabling suitable staff and roles to work remotely is a part of our strategy to retain skilled staff. The digitisation of high-use and mandatory files to a digital and secure format for staff to access at any time from any location is critical to the timely delivery of our services. The digitisation of records will leverage capability provided by our document and records management system and opportunities from the move to a cloud services arrangement. Establishing contracted services including an ICT help desk, ticketing, incident management and end-user device support will ensure our employees have a reliable, effective and timely service that ensures ICT issues or disruptions are handled efficiently and limits impact on staff ability to do their work effectively. Initially this work will focus on introducing a capability for client relationship management, workflow management and business intelligence. The full scope of the work to improve business applications will be determined in line with the delivery of unified communication technology as this needs to be in place first to build on the improved infrastructure. We strive to be recognised both nationally and internationally as a best practice regulator of pesticides and veterinary medicines, with the respect and confidence of governments, the community, the rural sector, chemical users and the chemical and veterinary industry. We can only achieve this if the risks we face are also managed in accordance with best practice. Our updated enterprise risk management framework and policy better reflects our approach to dealing with risks associated with relocation, service delivery, finance, people, compliance, reputation, stakeholders and service continuity. The framework outlines our risk appetite and will support staff to address risk tolerances in a consistent manner, enhancing adaptability and responsiveness as we transition our operations to regional Australia. Proper risk management ensures that knowledge is maintained in the organisation and that business can run as usual in the event of disruptions. Our senior leadership team meet on a regular basis to consider likely risk scenarios and ensure that potential risks have strategies for minimising disruption to the organisation. Agency risk managers identify and outline these strategies to manage risk through our strategic operational risk registers. These risks are assessed and treatments are developed and controls are documented. Risk treatments are regularly monitored to ensure they will be implemented correctly. We also have a fraud risk assessment and control plan in place that complies with the Commonwealth Fraud Control Guidelines, as well as a compliance plan which outlines the range of actions we may take in response to non-compliant or illegal behaviour. 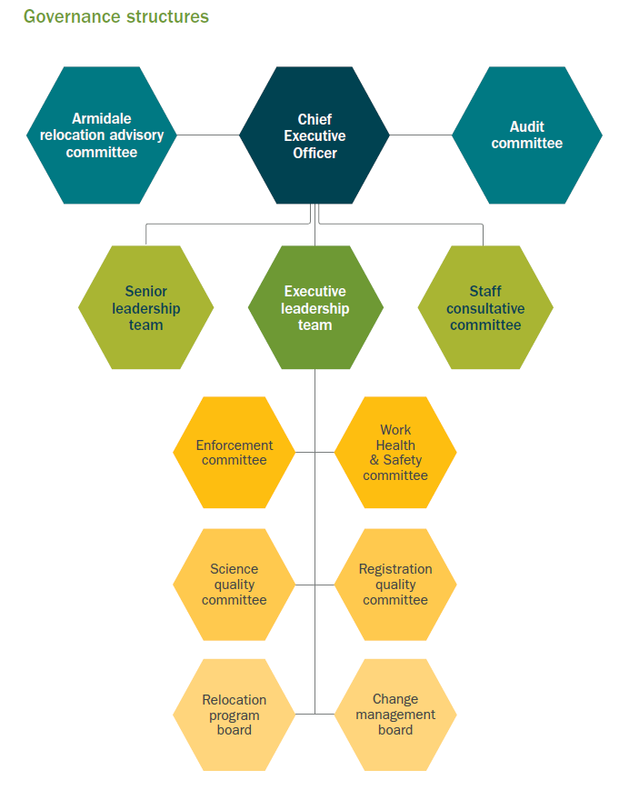 The audit committee is part of our governance and risk framework. Its terms of reference are to provide independent assurance and advice to the Chief Executive Officer (CEO) concerning the risk control and compliance framework, our financial and management responsibilities, and performance reporting and external accountability responsibilities. The APVMA relocation advisory committee (ARAC) provides strategic advice on major aspects of the relocation and the transition of our operations from Canberra to Armidale. The executive leadership team provides strategic, whole of organisation advice to the CEO and Deputy CEO to ensure effective decision-making, management and oversight of our operations and performance. The senior leadership team provides a forum for the senior operational managers in the agency to identify opportunities for cross-agency collaboration, innovation and performance improvement, and to develop leadership. The staff consultative committee is established under the APVMA Enterprise Agreement 2017–2020, and provides a forum to ensure that staff are appropriately consulted in relation to significant decisions that may affect the workplace. The health and safety committee provides a framework to allow workers to be consulted on significant work health and safety decisions that affect their working lives. The Enforcement Committee oversees the potential use and actual use of coercive powers to ensure that our enforcement activities are consistent and accountable and have reference to the APVMA’s Compliance and Enforcement Strategy, relevant policies and the Australian Government Investigation Standards (AGIS). The registration quality committee oversees quality assurance and the administration of registration decision making to ensure decisions are consistent, timely, transparent and predictable. The science quality committee is a forum to foster scientific excellence in the APVMA, enable debate of APVMA scientific issues and approve and prioritise proposals for the development or adoption of scientific methodology or standards by the APVMA or partner agencies. The APVMA relocation program board (RPB) oversees the relocation program of work ensuring the program meets its intended business outcomes through providing strategic guidance, support and oversight of the program’s progress. The RPB advises the CEO on key aspects of the relocation and enabling technology program and provides input into ARAC. We anticipate establishing a change management board in 2018–19. The board will have oversight of any significant change affecting the APVMA including legislative reform and business improvements. The board will provide governance oversight to ensure that there are consistent, aligned and integrated approaches to deliver ongoing business improvements, as well as recommendations from the ANAO and the Independent review into assessment performance.